Katharine is an amateur genealogist and has spent many years building her family tree. Old cemeteries hold many secrets, and countless stories that will never be told. The fading, moss-covered engravings on the forgotten stones each represent a real person who lived a life in a time gone by - a person who knew sorrows and joys, troubles and happy times, love and marriage and children and hard work. Every life, represented now only by ancient leaning markers, contributed in some way to the lives of those around them and intertwined with the stories of countless others, on their journey through a life that lead them, eventually, to this resting place. It is a shame that more of these life stories will never be told again. For the older stones, there is no one now living who remembers those buried there, or even remembers anyone who remembered them. It has been centuries since the last mourner visited some of these graves, and left a bunch of flowers in memory of the person whose name is etched on the headstone. The story of their life, as vibrant and interesting though it may have been, has receded, as countless others, into the faded fabric of time. These thoughts were occupying my mind one Cape Cod summer day when I was 12 years old, and had wandered down the street from my house to the little cemetery, located now behind an empty lot, but in what was probably once a small churchyard. 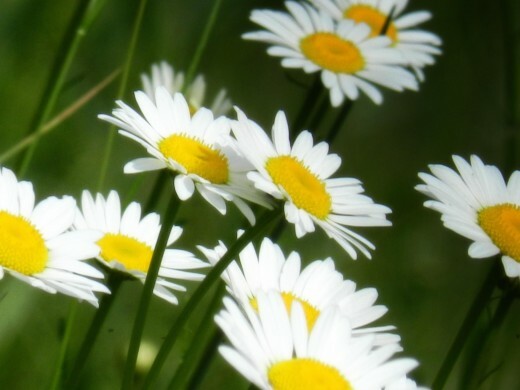 It was the daisies that had attracted me, tempting me to hop the fence that enclosed the cemetery, and pick a bouquet of pure white blossoms, nodding in the summer breeze. I stopped at a few of the ancient grave stones and read the names and dates, many written in an old script that was difficult to make out, although the letters were still clear. I was fascinated by the little rhymes and epitaphs that were often placed below the birth and death dates of the person buried there. It can be fascinating to read these epitaphs and verses etched into the headstones of people who have long since left this earth. One way of collecting and preserving these is to make a gravestone rubbing. Before you do this, be sure that it is allowed. Some cities and towns ban grave rubbings to avoid damage to the stones, although, if done carefully, the stones won't suffer any damage. Simply follow the steps below. 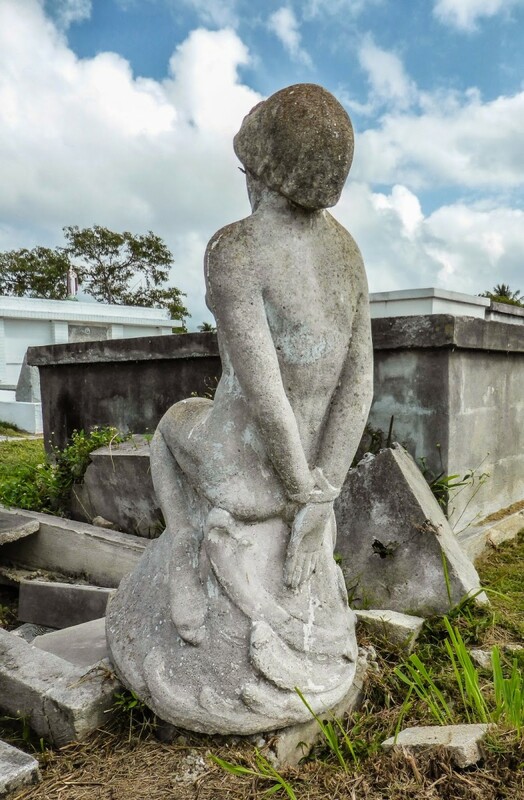 Who knows what fascinating cemetery stories you will discover! I continued my meanderings through the cemetery and noticed a stone with a tattered American flag, stuck in the ground on a small post next to it On the post was a medallion with an engraved image of a soldier in a tri-cornered hat and the words American Revolutionary War Veteran. Wow! 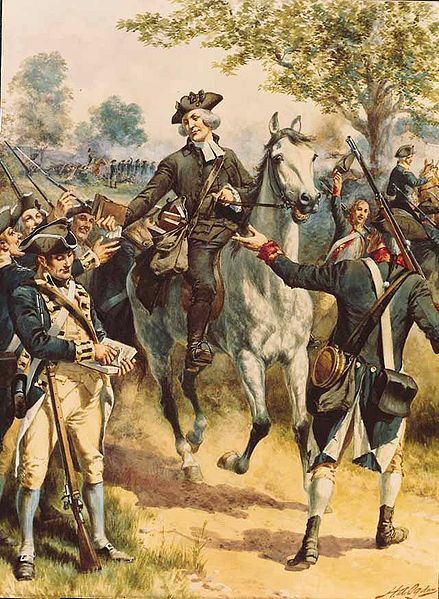 How cool to have found a man from my little town who actually fought in the Revolution! The name on the stone was Israel Nickerson, and he had died on 30th September 1791, at the age of 51. He had been a man in his 30's when he fought in the Revolution. Israel Nickerson's wife, Betsey, was buried next to him. I noticed that Betsey had lived to the year 1832, and had been 89 years old at her death. Forty-one years she survived after her husband's death - a long time to be a widow - and I felt sad for her, having lost her brave husband so long before she finally joined him. I wondered if they'd had children and grandchildren who had perhaps brought joy to Betsey's widowhood. Behind the stones of Israel and Betsey was a solemn row of dark slate stones, and I bent to read them. As I had suspected, the name on the first was Nehemiah Nickerson, son of Israel and Betsey. But, sadly enough, Nehemiah had died only days after his father, on 11th October, 1791, and he had been only 20 years old. How tragic it must have been for Betsey to have lost her husband and son so close together, and I wondered if it had been some kind of contagious illness that they had died from. To the solemn graves near a lonely cemetery, my heart, like a muffled drum, is beating funeral marches. The enormity of this family tragedy was clear to me, even at my young age. 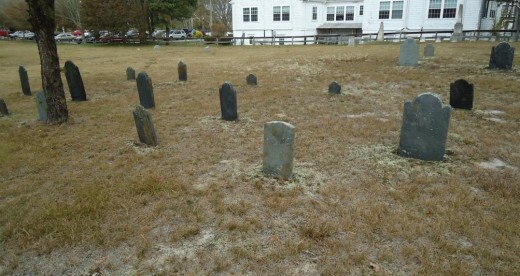 I stood gazing at the stones, and imagined poor Betsey, following the bearers of a casket in slow procession to the cemetery, day after day, that bleak October, and watching as each was lowered, next to the fresh graves of the father and siblings, and covered with the sandy Cape Cod soil. 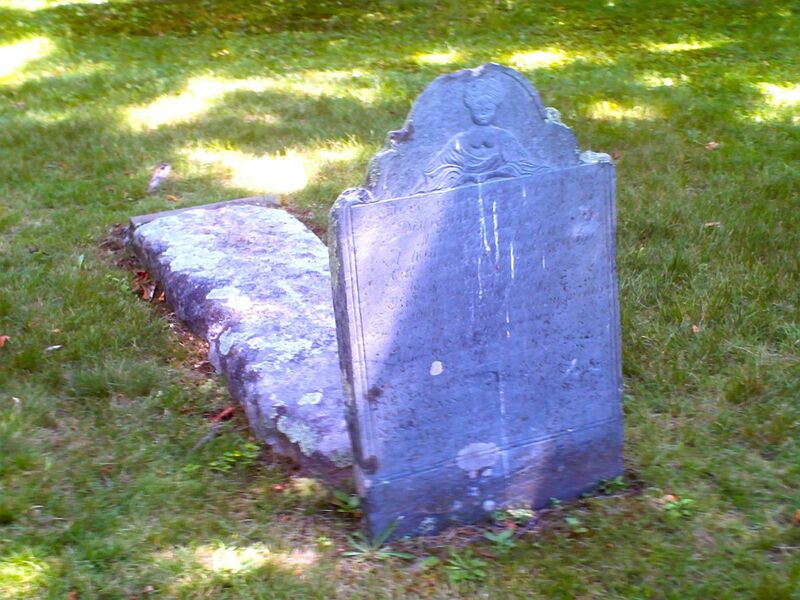 She must have been heartbroken, and the remainder of her long life must have been marked with sadness by her colossal loss in the fall of 1791. There are ways that you could help to preserve these fading and crumbling monuments to lives long past. Many cities and towns have projects going to map and record the inscriptions on their older graves. In most locations, they have been recording these details as they go along in recent years, but the older graves are frequently not recorded or the records have been lost or are incomplete. If your city or town has such a project, you would likely be asked to bring with you a map of the cemetery which the city will provide. You then mark the location of the grave, based on the location of those already identified, and transcribe what is written on the stone as fully as possible. Sometimes the inscription is impossible to decipher due to erosion, but other times the letters may be obscured by lichens or moss/mold that cling to the stone. If this is the case, your local project may request that you clean the stones as part of the process. 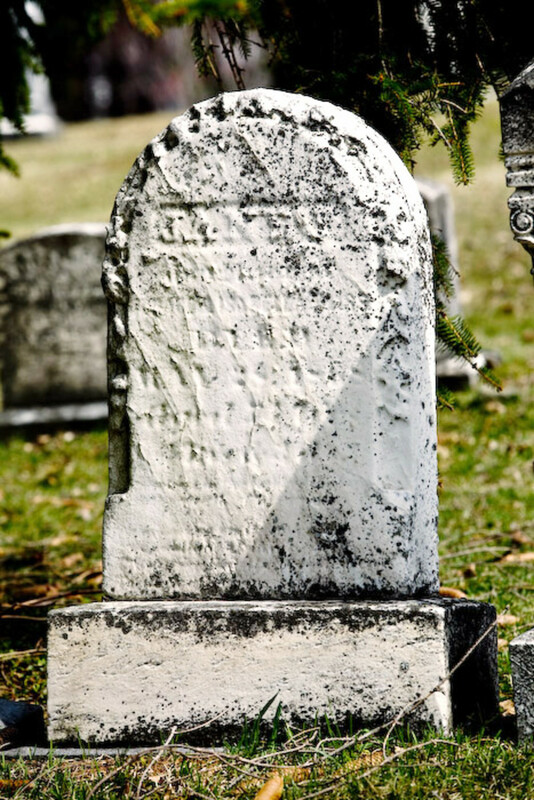 Do not attempt to clean gravestones unless you get permission, however, and be sure you know how to do it and how to avoid possible damage to the stones. 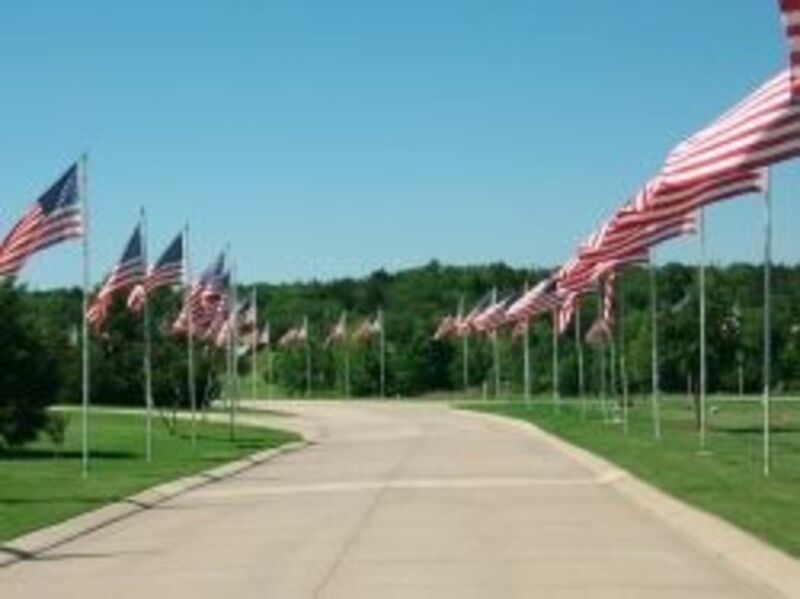 Some materials that were used for markers are less durable and more easily damaged than others and you will want to educate yourself about the particular types used in the cemetery you are working in. If you find that your locality does not have a grave identifying program in place, why not suggest that one be started? 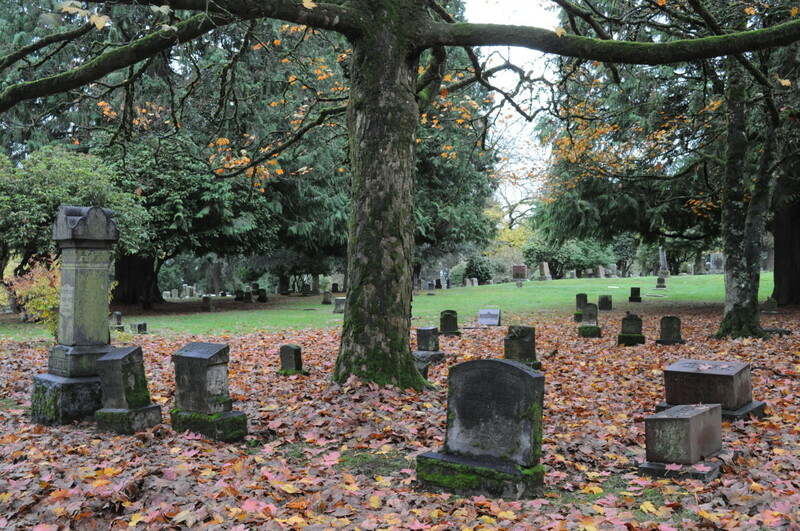 Many of the older graves will soon be lost to history if they are not recorded and cataloged. Once done, even when they are no longer legible or even if they crumble away, there will be a record of each individual's final resting place and what their headstone said for those coming after to read and to know about them. I walked home with my daisies and my mother found a large vase for them as I told her about my findings in the cemetery. Luckily for me, my mother happened to be the town historian, and she knew about the fate of this family. Almost unbelievably, the family had apparently resided in the house right next door to my own! 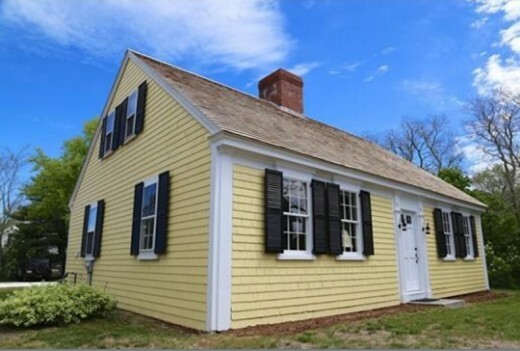 It is a low rambling house with small multi-paned windows and had always been painted a light yellow color since I could remember. I asked my mother what had happened to the family, and she confirmed that it was indeed a mysterious illness that had devastated the family that fall, but she couldn't recall the details. The next day she told me she had found a reference to the Nickerson family and their tragic story. Apparently, Israel Nickerson had become a successful mariner on a trading ship, and had gone on many long sea voyages, as far away as Asia, returning with ship loads of exotic goods, which would be sold and traded in the area. 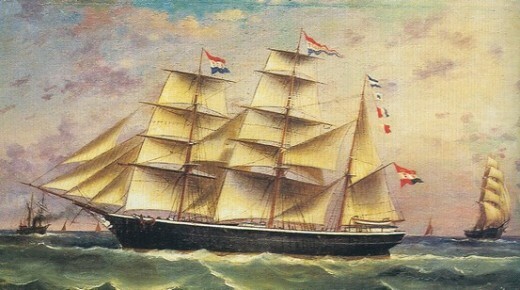 On one such voyage, the ship had returned with half its ship hands either dead or dying from some unknown illness that they had no doubt been exposed to in a foreign land during their travels. Israel was among the sick, and Betsey rushed him home to care for him and pray for his recovery. Her efforts were to no avail, and he died a few days after his return. Then, one by one, her children fell ill. One after another, they succumbed to the mysterious illness and were laid to rest in the church yard, where I had found their forgotten stones. The reference that my mother had found regarding this horrific event mentioned that Betsey and Israel were followers of the Baptist faith, not a common choice in these parts at the time. Baptists don't believe in having their children baptized as infants, but rather when the child reaches maturity and is able to understand and embrace the baptismal ceremony. 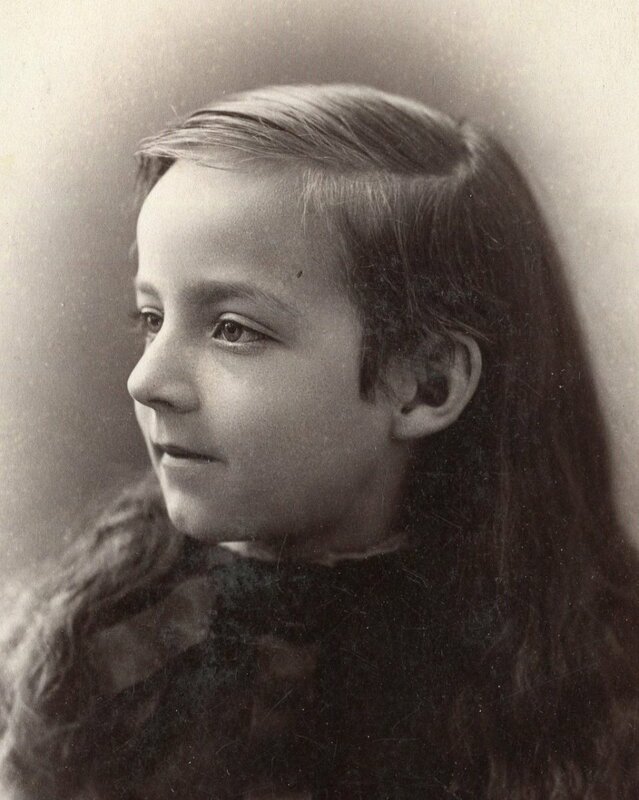 When it became clear to Betsey that her whole family might succumb to the disease, she frantically sent word to the the preacher, who was tending his flock on the north side of town, to come and baptize her youngest child, Horace, who was only five years old. The roadways being as they were in those days, and travel being as slow as it was, by the time word got to the preacher, his best efforts to hasten to the Nickerson household were not enough. Little Horace lay dead by the time he arrived. It was said that poor Betsey was wracked with feelings of guilt that her child had not been baptized prior to his death, leaving the fate of his soul uncertain. No doubt these thoughts haunted her for the rest of her long life. My mother was also able to tell me that Israel and Betsey had been the parents of thirteen children and, thankfully, the other eight had lived and thrived will into the 1800's. So, old Betsey did indeed have grandchildren to brighten her aging years, and they had children, and they had children..... some of whose descendants live in the town to this day and had even married into my mother's family, making this Nickerson family distant cousins of mine. 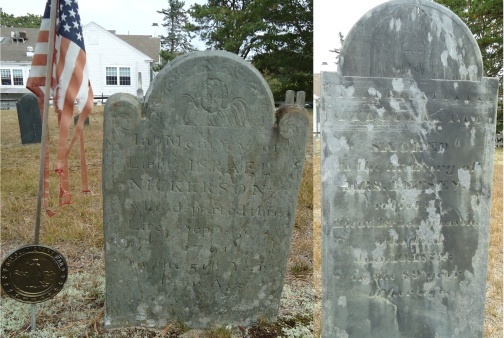 I wondered when the last time was that Betsey Nickerson had visited the graves of her husband and children. 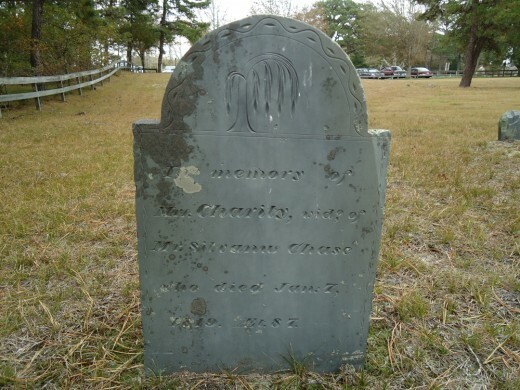 Did her surviving children bring her there in 1832 to pay her final respects before she too passed away? Did they continue to visit the graves of their parents and siblings in the years that followed? Certainly, it had been many, many years since anyone who knew the tragic story had paid a visit to the cemetery in their honor. I returned to the cemetery a few days later to pick some more daisies. 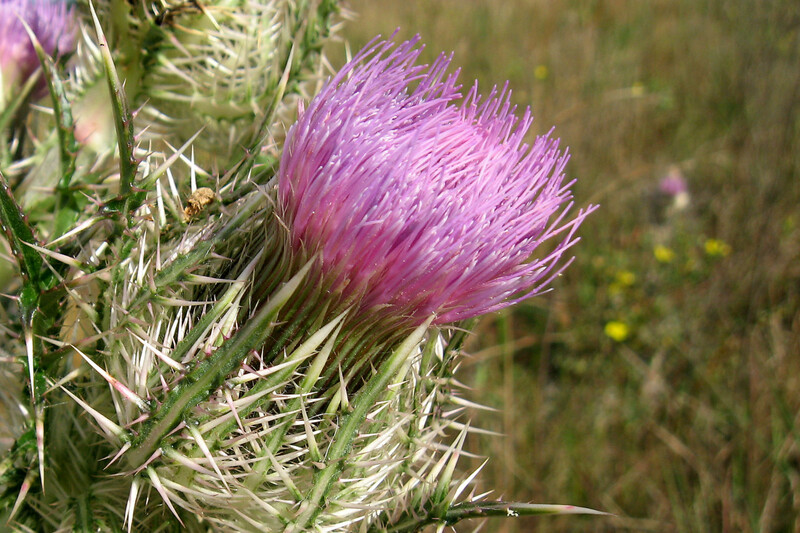 But this time, they were bound up in little bunches and tied with long pieces of timothy grass along with a few yellow buttercups to form mini-bouquets. Each bouquet was laid at the stone of each long-dead member of the Nickerson family. And for the few days that those bouquets lay fresh beneath the gray slate stones, the Nickerson family's sadness was revived and honored, their story having been told, and their lives and deaths, nearly two centuries later, were remembered once more. What a sad story and thank-you for sharing it. Thank you for sharing the non-creepy view of a cemetery. So many seem to avoid them, yet a walk through a cemetery can tell the history of an entire family and sometimes a community as well. I've been deeply saddened at the forgotten cemeteries in the area, for they are not just places, but tributes to those who lived before us. I am so glad you decided to write this particular hub. It's good that someone has remembered this family and told their story. Like you, I often wonder about the lives of those whose names are written on the stones. It's awesome that you found out about your particular family, and wonderful that you have shared it. Voted awesome and up! This was a wonderful story. You did your research and followed up on this family to recreate what we now know. Thanks for putting flowers on their graves in remembrance. 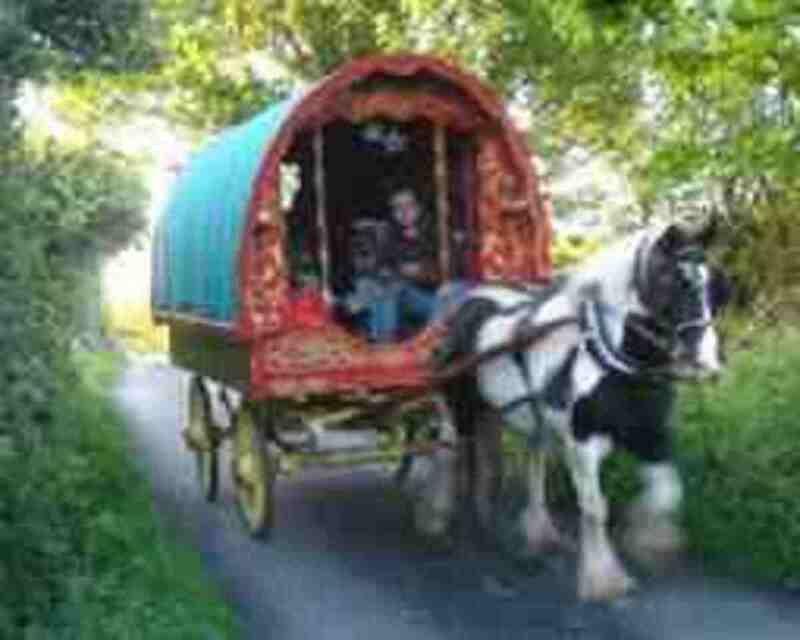 Additionally, the Nickersons came over on the Mayflower. I grew up in Downeast Maine and knew some Nickersons. What a beautiful way to honor the family and tell the story. Great hub! What a fabulous and fascinating hub - and a very sad story that was probably all too common on days gone by. Old graveyards have to be one of the best sources of history around. And you feel that you are almost personally involved with the people you are reading about - as you found out later you were in fact very personally involved! I really enjoyed this hub and it's history - even although very sad. That it is. I am feeling the pull toward genealogy, and have stopped myself because I know I will get sucked in quickly! Thank-you, moonlake, for stopping by and commenting! Genealogy is definitely a process of solving one mystery after another! What an interesting and sad story about the Nickerson family. My grandmother had 7 children live and 7 died all young. I do genealogy and I wonder when there's 10 years between census how many children died in those 10 years that maybe no one knows about.